This is a sponsored post by UnitedHealthcare. All thoughts and opinions are my own. Health care is not something that most of us prioritize. Few of us appreciate the likelihood and ramifications of the health risks we face. Around 80 percent of Americans admit that they delay or forgo health care in favor of other priorities like family or work obligations. Moreover, a large percentage also turns to Google and WebMD to self-diagnose and treat themselves at home when they do need medical attention. Another study by Dr. Fuschia Sirois of the University of Windsor shows that the tendency to put off essential healthy behavior like exercise or regular check-ups can add to increased illness. When it comes to leading a healthy life, change can be hard. While it’s not very difficult to exercise, eat healthier or go for routine medical checkups, it’s far easier to procrastinate. People usually skip visiting their doctors, procrastinate scheduling preventive health checkups or even delay buying health coverage because they think it is a time consuming, complicated and costly process. The same is true when you as a small business owner think about buying health coverage for your employees. As a small business owner, you know that offering health insurance is imperative to hiring and retaining top talent as well as improving team productivity and happiness. However, buying the right health insurance for your employees can seem like a complicated, expensive and time-consuming task. Well, it turns out, if the insurance purchasing process is made simple and fast, you make highly informed decisions and procrastinate less. UnitedHealthcare is now making the process easy, affordable and quick so that you don’t have to delay on buying health care for your employees. Steady rise in the cost of health insurance is the biggest problem facing small business right now, according to the NFIB Research Foundation’s quadrennial Small Business Problems and Priorities survey. The cost of coverage for an employer-sponsored family plan climbed 3 percent this year to $18,764 on average, says a survey conducted by the Kaiser Family Foundation with the Health Research & Educational Trust. This has led to only half of American small business owners – with three to 49 employees – offering health coverage in 2017, adds the survey. Moreover, the sheer complexity and number of health plans available in the market causes majority of employees to select the wrong health plan that costs more money yet provides no additional insurance protection. 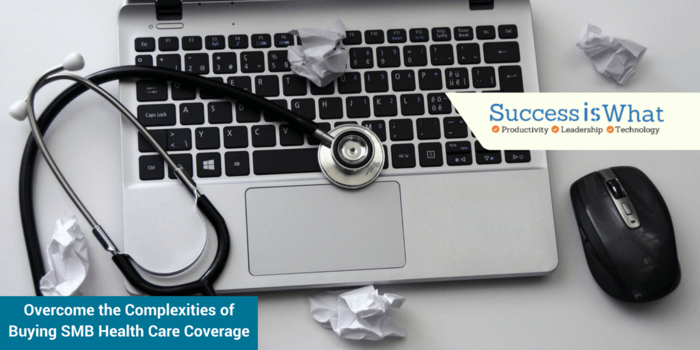 Sometimes, employees are so overwhelmed by the complicated set of insurance benefits offered to them that they don’t opt for any health plan. So, even if you fall under the 50 percent of small business owners who buy health insurance for their employees, your workers may end up choosing the wrong benefits or do nothing at all. It doesn’t have to be this way, though! Buying the right health plan for your employees can be a simple and quick process. You can do it in under 20 minutes with UnitedHealthcare. Go to the UnitedHealthcare website and click ‘Get Started’ button. Next add your zip code, number of employees and when you want to start coverage. The online tool will then find all available plans in your area within minutes. If your state isn’t covered, you can contact an adviser for more options. Every page has the name and contact details of a personal advisor in your area. You can also request a call or get help via email. Once you get the list of medical plans, view and customize your plan offering, add your employee details and set your monthly budget. Lastly, create your account and buy insurance cover for all your employees at one go. The UnitedHealthcare site not only simplifies the process of buying health cover, but also educates you and helps you understand health insurance and what you’re buying. This page gives you an overview of the number of plans available in your area, grouped by deductible, network or metal tier (you can change the group category). At this stage, you can decide offer all the available plans to allow your employees to make the best decision or you can remove some plans. If you offer at least six plans, your employees can use UnitedHealthcare’s interactive Employee Fit Finder tool. This tool asks them about their family and lifestyle to point them in the right direction and can bring additional convenience and peace of mind to your team members. Here you can see at a glance important financial details of each plan – costs to the employer, costs to the employee, deductibles, out-of-pocket maximums, drug costs, etc. On this page, there is also the option whereby you can pay a portion of the dental and vision coverage benefits for your employees. You need to contact your Coverage Advisor who can add this to your package. By default, your employees add dental and/or vision coverage at their own expense. You can also see plans that fit your employees, and what they’ll pay, before you buy in the ‘explore employee profiles’ section. In the next stage, you add your employees’ details. You need to provide employee ID, zip code, age, gender, and family details too, if applicable. It is easy to import employee data through Excel, Xero or Quickbooks Online so you don’t have to waste time keying in the details. Before you move to the next stage, the tool will ask you create an account or sign in so that you can review, edit and share a saved quote; access saved information securely from any device; and get support quickly and easily. You can decide to skip this step and come back to it later. Next step is to decide how much you want to pay on a monthly basis. Your employees pay the balance depending on the coverage plan they select, so your costs remain fixed every month. The tool gives you a minimum amount and you can adjust the slider to hit your monthly budget target. The budget you set does not affect the plan availability. Doing this just locks you in for a fixed monthly cost no matter which insurance coverage your employees select. This is fantastic for both you and your employees. You incur only a fixed cost, and your employees take the coverage they want. You are ready to go. Just create your account or sign up, enter your payment details and buy quick, affordable and effective coverage for your employees. You can take a simple step today towards becoming a company that places its employees health and happiness first. When buying health cover is this quick and easy, why not head over to the UnitedHealthcare website and check out the process. Disclaimer: The views expressed do not reflect those of UnitedHealthcare nor its affiliates. They are my personal opinions. While UnitedHealthcare has made every attempt to ensure accuracy, the information contained in these blogs may change and UnitedHealthcare assumes no responsibility for errors, omissions, contrary interpretations of the subject matter or information herein or for any losses, injuries, or damages arising from its display or use. These blogs may connect to other websites maintained by third parties over whom UnitedHealthcare has no control. UnitedHealthcare makes no representations as to accuracy, completeness, suitability, or validity of any information contained in those linked blogs or third party websites. Blogs are for general informational purposes only and not intended to be medical advice or a substitute for professional health care.